An investigation into the murder of a sports reporter leads Michael and K.I.T.T. into the world of boxing, where they must apprehend a villainous promoter and persuade a former champ not to step back in the ring. 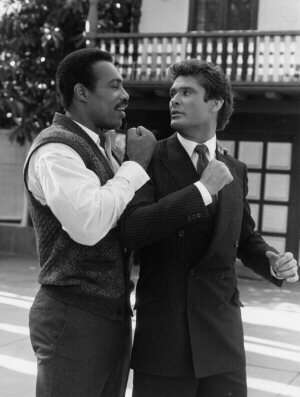 David Hasselhoff was injured whilst filming the close-up of Michael's slide down the elevator, and required "emergency surgery" on his posterior. He remarked to TV Guide at the time, "I'm on my feet and walking around now but I'm not sitting pretty." Jerry Quarry, who was kayoed by Kenneth H. Norton in 1975, and promoter Don King make cameo appearances. Norman Burton previously appeared in the first season episode A NICE, INDECENT LITTLE TOWN. Ken Foree also appeared in the episode KNIGHT IN DISGRACE. 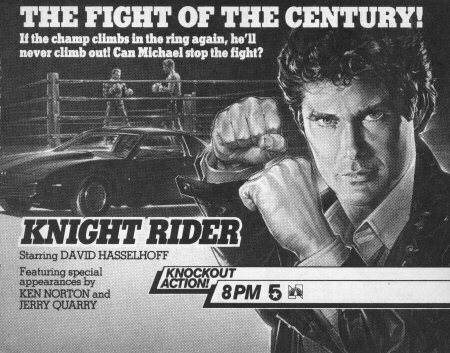 The rerun of this episode was the last ever Knight Rider to be shown in its prime-time slot on NBC on August 8th, 1986. The cameo appearances weren't scripted with Jerry Quarry, Don King et al. necessarily in mind. Quarry's part is "Jerry Red", and Don King was written as "PR Man." Carlos Palomino and Danny Lopez were added in later stages. As scripted in the early drafts, Michael proceeds to drop-kick Davis after the promoter tells him he has a bad heart. This admittedly bad decision was rectified in later drafts. The Avec Moi perfume was originally named Joie de Vei.